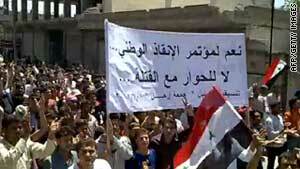 Syrian anti-government protesters march during a demonstration in the town of Kafr Nabel on Friday. Barzeh, Syria (CNN) -- At least nine people were killed in an angry day of protests across Syria on Friday, six in the restive western city of Homs and three others in the outskirts of the capital Damascus. Demonstrators also massed in Aleppo, Hama, and other locations, according to activists and videos surfacing on the Internet, and they come on what has been a weekly rite: Countrywide anti-government protests after Muslim prayers every Friday since the country's unrest began more than three months ago. Rami Abdulrahman of the Syrian Observatory for Human Rights told CNN that along with the six dead in Homs, two were killed in al-Qadam and another in Daraya -- both Damascus suburbs. Abdulrahman said the death toll since mid-March is more than 1,360 civilians and more than 340 army and security personnel. State TV reported that "armed men" in al-Qadam shot at anti-riot forces and citizens, killing a civilian. Footage showed people with their faces covered throwing rocks. The report said armed men shooting at police and civilians in Homs killed a police officer and attackers assaulted the labor union headquarters and wounded one person. It is unclear whether those fatalities are among the six reported by the human rights group. Human rights activists have said that Syrian security forces have been launching violent crackdowns on peaceful protesters since mid-March. World powers have denounced the regime for its fierce clampdown on protests. Syria, however, has disputed the criticism and has blamed the bloodshed on "armed groups." But the Syrian regime has made significant gestures amid the mounting criticism. Earlier this week, it allowed opposition activists to hold a gathering, and on Friday, the government escorted international reporters, including CNN's Arwa Damon, to anti-government protests. She witnessed a protest of a few hundred people in the Damascus suburb of Barzeh, hearing people chant for freedom and call for the downfall of the regime. Protesters changed "peaceful, peaceful" around a massive Syrian flag. Despite warnings from government minders of danger, Damon and a CNN crew broke away to look around and talk to others. Last week in Barzeh there had been violence, with at least five people killed, and bullet holes in a number of buildings illustrated the violent aftermath. CNN journalists met a man who said his 27-year-old son was killed weeks ago, and others showed spots where other casualties occurred. Damon spoke to a man who said he was a doctor and worked in a tiny room that served field hospital to treat injured demonstrators. He said people were afraid they'd be arrested if they went government hospitals and chose to be treated there. Some bled to death, the doctor said. People on the street in Barzeh told Damon that there haven't been armed elements among protesters. But many of them covered their faces with scarves for fear of being identified and then detained by security forces. Despite the risks, they said, they believe their movement has the resilience to succeed. While anti-government demonstrators insisted that Syria can't exist as long as President Bashar al-Assad is in power, the sentiment was different elsewhere in the area. In the heart of Damascus, there was a demonstration in support of al-Assad. It was a festive-like atmosphere with people extolling the president. "God, Syria and only Bashar," they said. Security personnel were out in force in Aleppo preventing demonstrators from gathering in the neighborhood of Seif el Dawla, where a protest was planned, said a human rights activist communicating with CNN from Aleppo via text message. "I tried to go to Seif el Dawla but they stopped the taxi and checked my ID," said the activist, who for fear of reprisals from the government, only gave his first name "Sanharib." "If your address shows that you aren't a resident, you can't even get in," he said. In the rural northwestern region of Jabal Zawiya, crowds of protesters could be heard over the phone denouncing the government of al-Assad, a day after Syrian tanks and helicopters launched deadly raids through villages in the surrounding area. "They killed a young woman named Fatoum Hallaq," said a resident named Mohammad Ismail in a phone call with CNN, as protesters chanted anti-government slogans in the background. It is unclear whether she died on Thursday or Friday. "She was hiding among ruins. There was a pyramid next to her. They bombed the old pyramid and she died there." The region of Jabal Zawiya is home to the ruins of several ancient Byzantine "dead cities" which activists claimed Syrian security forces shelled on Thursday. A video uploaded to YouTube on Friday, purportedly filmed in the western city of Homs, showed men carrying a man whose white shirt was drenched blood, through the streets of the city. State TV also reported that two security forces were wounded when "armed men" opened fire at security personnel and citizens in Homs. Thousands are protesting in the western city of Hama, according to a state TV report, and videos purportedly from that western city showed mass gatherings. Videos purportedly from Qamishli in the Kurdish region, Abu Kamal in the east, and the coastal city of Latakia have surfaced on the Web. CNN is not able to independently verify the reports. This comes as U.S. Secretary of State Hillary Clinton on Friday condemned attacks by Syrian forces on protesters, saying time was running out for al-Assad to begin a meaningful political dialogue with anti-government demonstrators. Clinton's remarks followed reports a day earlier that busloads of what an activist called "government thugs" were brought into Aleppo, one of Syria's largest cities, to break up a demonstration. The activist did not want to be named for security reasons. "I'm just hurt by recent reports of continuing violence on the border and in Aleppo, where demonstrators have been beaten, attacked with knives by government-organized groups and security forces," Clinton said during a news conference with Lithuania President Dalia Grybauskaite in Vilnius. "It is absolutely clear that the Syrian government is running out of time. There isn't any question about that." Clinton said al-Assad's government must allow "a serious political process that will include peaceful protests to take place throughout Syria and engage in a productive dialogue with members of the opposition and civil society, or they are going to see increasingly organized resistance." "We regret the loss of life and we regret the violence, but this choice is up to the Syrian government. And right now we're looking for actions not words, and we haven't seen enough of that," she said. CNN's Ivan Watson, Rasha Qass Yousef, Yousuf Basil, Nada Husseini, Jomana Karadsheh, Arwa Damon, Hala Gorani, Yesim Comert and journalist Vaidotas Beniusis contributed to this report.